I just have to put it out there that if I’m going to spend the calories on a dessert, it should satisfy not only my sweet (and salty) tooth, but also take care of my boozy tooth too. Specifically, desserts that include some sort of dunking, spritzing or drizzling of alcohol that can make my toes tingle is a good thing. Especially Tiramisu. 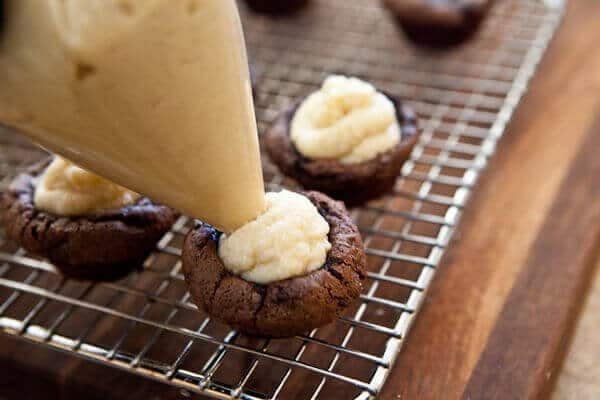 So while the recipe for these cupcakes calls for a quick brushing of coffee liqueur before the topping goes on, feel free to do as I did and brushed liberally….and then help yourself to another shot for your afternoon coffee. I promise, I won’t tell. While traditional Tiramisu is multiple layers of ladyfingers, coffee liqueur, mascarpone and cream, this cupcake is simpler to make, only 2 eggs (some recipes call for 7 egg yolks!) and no overnight wait. There are still layers in this cupcake! 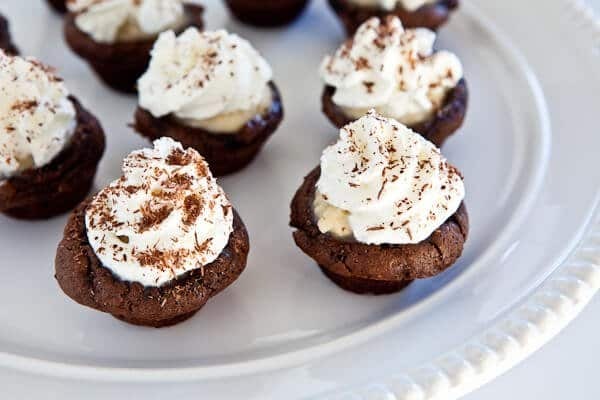 Rich, fudgy chocolate cake, then a brushing of coffee liqueur, then creamy mascarpone cheese, then whipped cream and lastly chocolate shavings. The surprise in this recipe is that cake mix is used, but instead of following the directions on the box, the mix is combined with sour cream, 2 eggs, coffee granules and just a couple tablespoons of water. 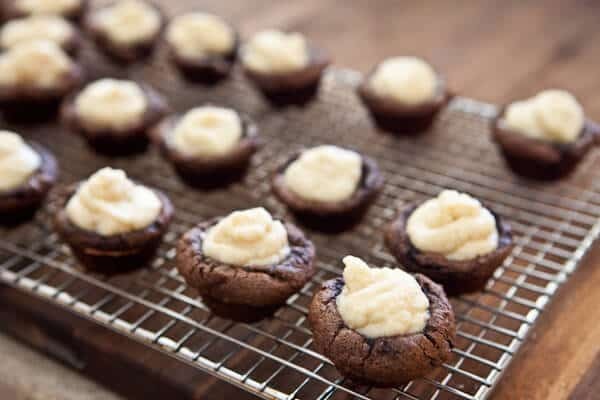 This creates a batter is thick, almost fudge-like and makes the cupcakes rich and intensely coffee-chocolaty. I didn’t have instant coffee granules, so I ground my coffee on the finest setting instead and it was perfect. I got a nice crunch texture using regular coffee. 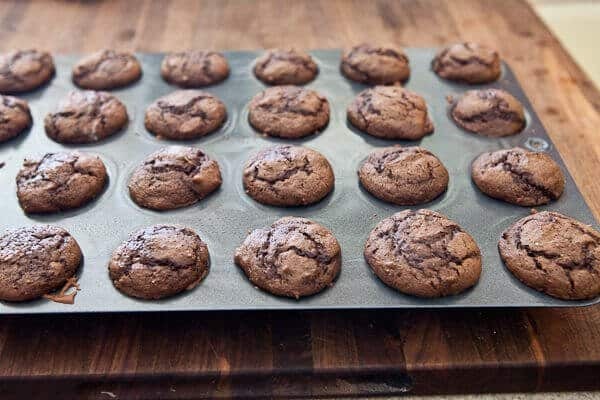 Here’s Pampered Chef’s Deluxe Mini Muffin Pan – each cup holds about 1 1/2 tablespoons of filling, which makes these the cutest mini-cupcakes ever. 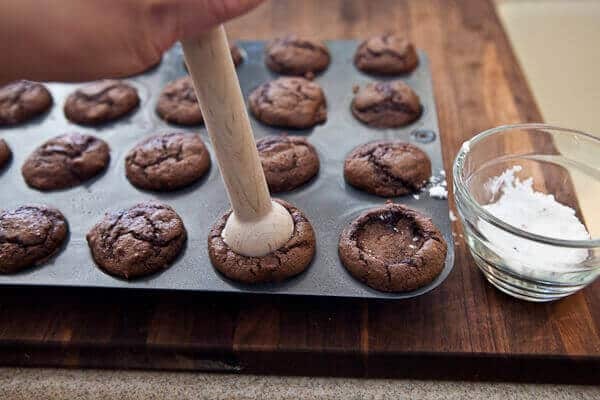 You can use a regular muffin pan too. The mascarpone layer is so simple – just combine the mascarpone cheese with powdered sugar and vanilla extract. After the cupcakes are baked, you’ll immediately use something to make indentations for the mascarpone layer. 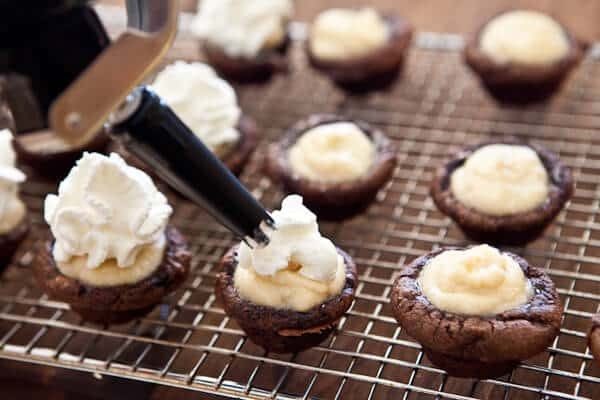 I used the Pampered Chef Mini Tart-Shaper tool dipped in powdered sugar, but you can use the bottom of a shot glass or any other item you can find in the kitchen to make the indentations. You have to do this while the cupcakes are still hot from the oven. A veeerrry nice brushing of coffee liqueur (like Kahlua) is next, and then pop them out to cool completely on a rack. The mascarpone cheese filling goes into a plastic bag with the tip snipped off and piped into the indentation. You can use a pastry bag if you want, but a plastic bag works just fine. 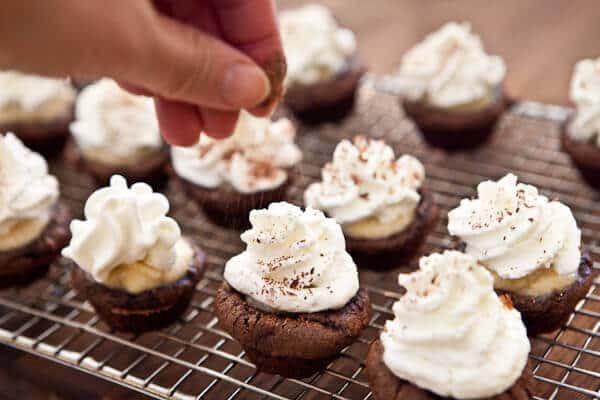 This Tiramisu Cupcake recipe comes from Pampered Chef – I recently flew over to their HQ in Chicago to film their very first live cooking show and made these Pumpkin Whoopie Pies. 1. Preheat oven to 350°F. Spray the muffin pan with nonstick cooking spray or just rub the insides with cooking oil. 2. To make the cakes, combine the cake mix, combine cake mix, sour cream, egg, coffee granules and water. The batter should be thick. 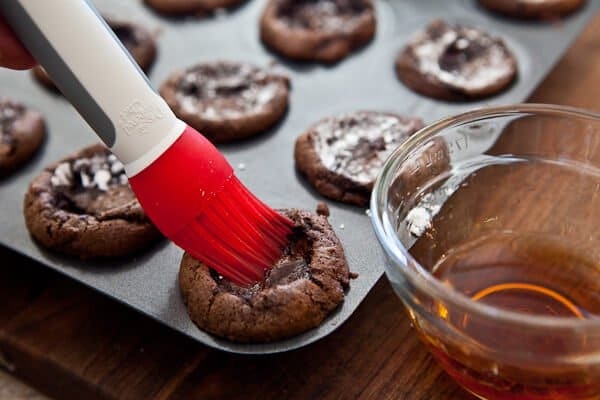 If using regular sized muffin pans: divide batter evenly among cups of pan. Bake 10-12 minutes or until wooden pick inserted in centers comes out clean. 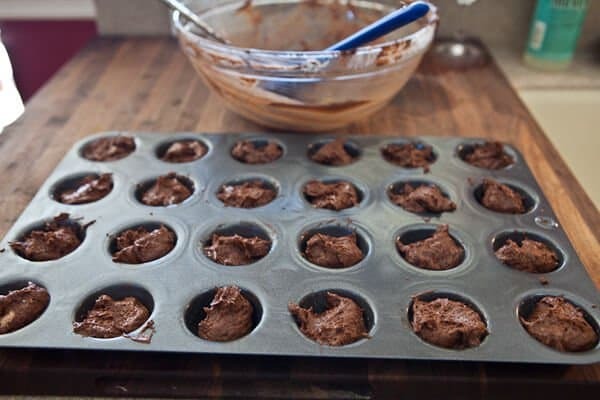 If using Pampered Chef Deluxe Mini Muffin Pan: spoon 1 tablespoon of filling in each cup. Bake 8-10 minutes or until wooden pick inserted in centers comes out clean. Repeat with remaining batter. 3. 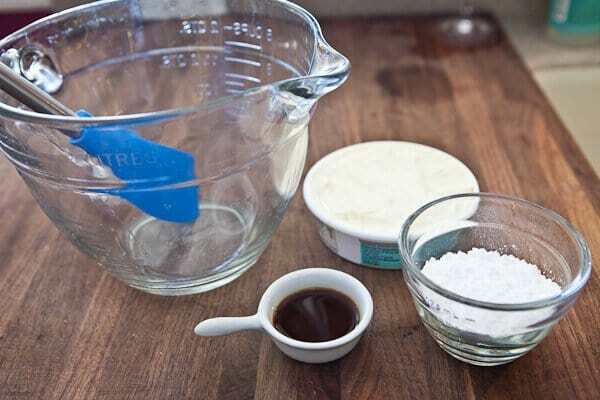 Meanwhile, mix together the mascarpone cheese, just 1/4 cup of powdered sugar, vanilla extract. Put in plastic bag for piping and set aside. 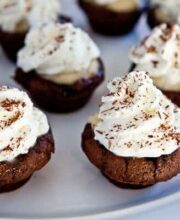 You can also place your whipped topping in a plastic bag for piping and refrigerate until needed. Place remaining 2 tablespoons of the powered sugar in a small bowl and have your tart-shaper (or whatever you will use to create the indentations) ready. 4. When the cakes are done, immediately make the indentations with the tart-shaper. Dip the tart-shaper in the powdered sugar to prevent the cake from sticking to tart-shaper. Brush the tops of each cake with the coffee liqueur. Move the cakes to a cooling rack to cool completely. 5. Trim corners of both bags. Pipe filling over cakes. Pipe whipped topping over filling. 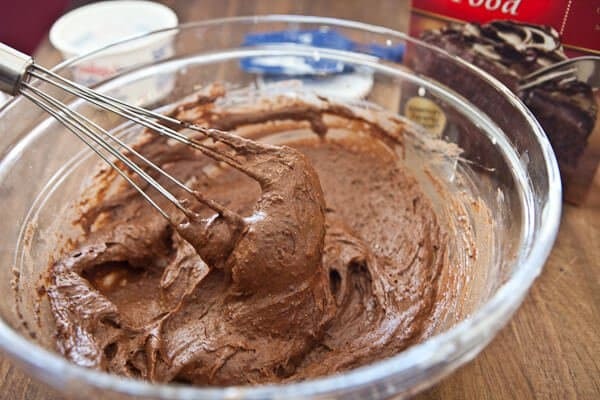 Sprinkle with shaved chocolate or cocoa powder.